Baileys Pudding Shots are an easy three ingredient cocktail recipe! They’re perfect for an after dinner drink and you can make them into a mocktail too! 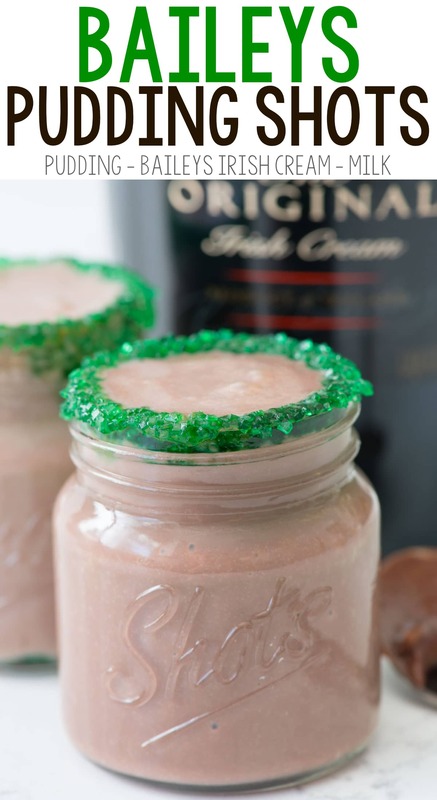 So this weekend is the Baileys Holiday AKA St. Patrick’s Day! Baileys recipes are all over the internet this time of year but I don’t discriminate: Baileys is perfectly acceptable all year long. Funny story: so when I’m on trips (either vacation or for work) I like to drink Baileys in my coffee…for breakfast. I mean, I’m not driving, so it’s really just a good creamer. A friend of mine always packs mini Baileys whenever she travels and we were at the hotel restaurant having breakfast and working (with our laptops, so really working, not just talking). I poured some of the Baileys into my coffee and happened to catch the eye of another patron across the restaurant…from her look it would seem not everyone thinks to travel with mini Baileys bottles. YOU’RE WELCOME INTERNET. 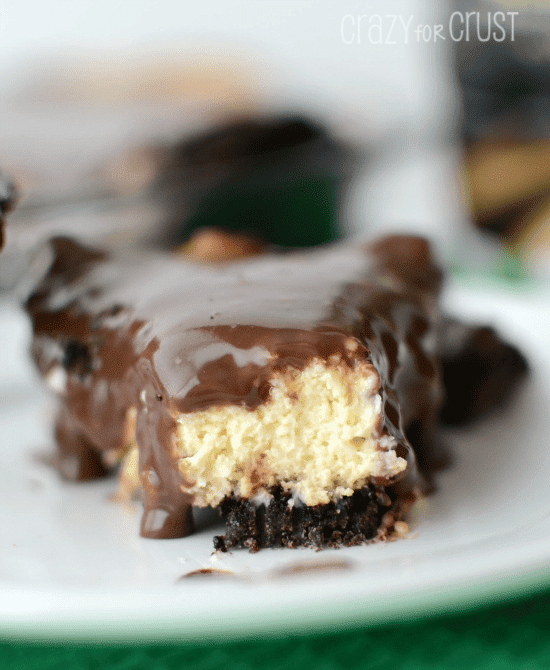 Whether or not you celebrate St. Patrick’sDay, these Baileys Pudding Shots are good all year long…but maybe for dessert and not breakfast. But I won’t judge, you do you. Baileys Pudding Shots are an easy cocktail that makes pudding drinkable with the help of Baileys Irish Cream! I said milk and/or Baileys because you can make these as strong as you want: stronger, don’t use milk. Weaker, water it down with milk. 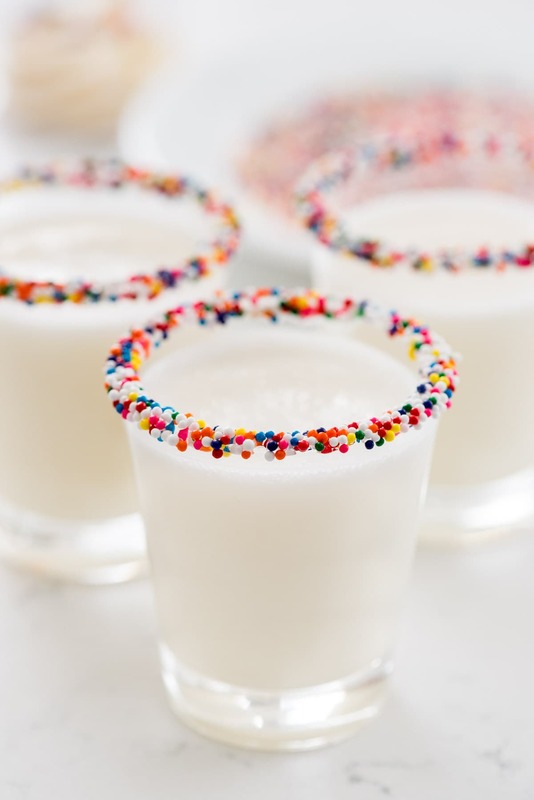 You can also make these into mocktail Pudding Shots by skipping the baileys and using milk. Add a teeny tiny drop of mint extract for that minty (Irish) flavor. Question: do the Irish love mint or did they just get stuck with it because St. Patrick’s Day = green? These pudding shots are the perfect after dinner cocktail for anyone who loves Baileys and chocolate! 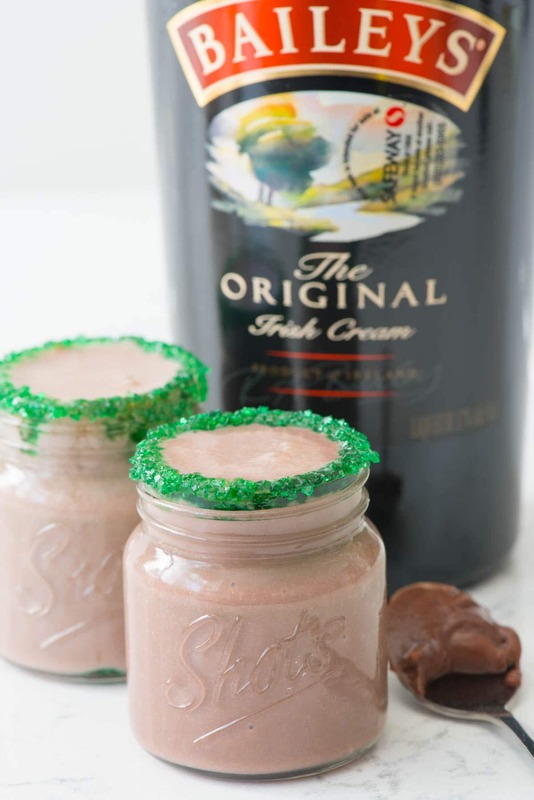 Baileys Pudding Shots - these easy three ingredient cocktails are perfect for St. Patricks Day...or any day you want Irish Cream! They can be made for kids too! Place corn syrup (or honey) on a shallow plate and green sanding sugar on another. Dip each shot glass upside down in the corn syrup then in the sugar. Place pudding, milk, and Baileys in a two cup measuring cup. Whisk until combined. Pour into shot glasses. Non-Alcoholic version: omit Baileys and double the milk (use about 5-6 tablespoons). Add a drop of peppermint extract to make it minty. Thanks Debbie! I couldn’t agree more. 🙂 Happy St. Patrick’s Day! The great thing about blogging is that you love it. I feel the same way! It’s almost like an addiction to see what I can come up with next. I also love the way that I am inspired and educated by women from all over the country and I can create relationships with women who have no idea what I look like. Your baileys looks amazing, but I adore you for the work that you do for your love of blogging. Pinned! And I want one right now! Thanks so much for sharing at Mom On Timeout! Where did you get those adorable shot jars?